The ARCHITECTS system is an innovative acoustic panel system that can be used to partition large spaces conveniently and help redefine workspaces. The system offers a means to uniquely combine structure and tranquility, without losing the transparent feeling of an open office space. The system is entirely mobile and provides a wide variety of solutions to flexibly place the panels in a room so they can be adapted to meet your individual needs, and the results can be seen and heard. A basic need to design offices with an airiness and transparency means architects are often eliminating small areas within an overall office structure and starting to develop open space offices more and more. In the process, it is essential to partition an open office space both acoustically and visually to achieve a functional balance between transparency and intimacy, between acoustic quality and tranquility. Focused planning needs to accompany innovative product solutions to avoid being drawn into the openness trap, where everyone hears everything and the visual concept of individual spaces becomes imperceptible. 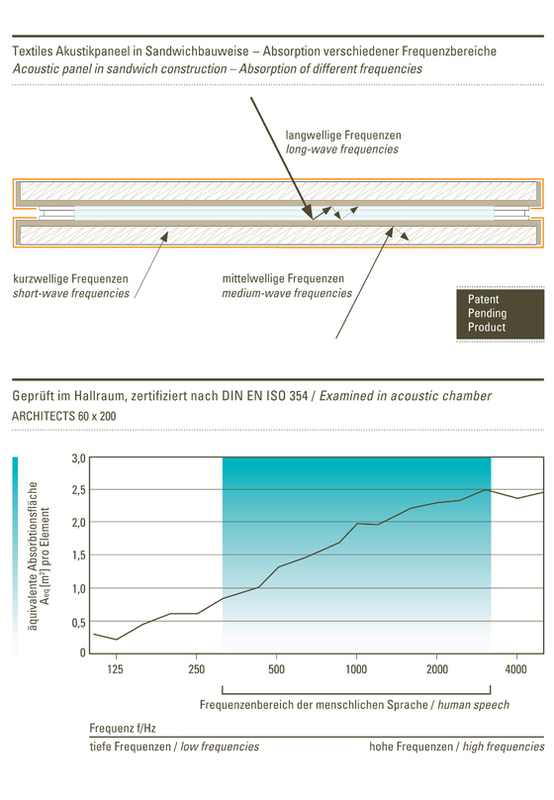 ARCHITECTS combines high efficiency in acoustic properties with slender product design, for which we have even registered a patent. 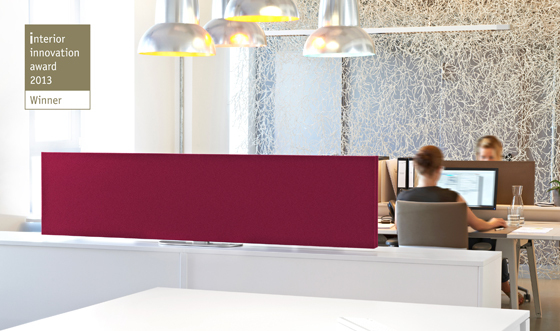 Owing to the combination of select materials, an intelligent connection system, and an innovative product design in acoustics, the performance of the two-sided panels is incredible. All the same, this elegant panel is amazingly flexible, offering maximum freedom in designing the acoustics of open spaces in an individual manner. ARCHITECTS offers many options for planners of modern office spaces to efficiently design the acoustic properties, creating peacefulness and tranquility without losing the big picture. 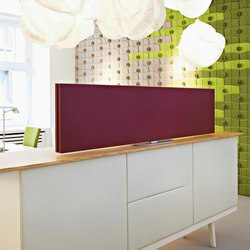 The panels can be placed on tables, sideboards, or even the floor, yet moved around as needed. In addition, they can be flexibly suspended from the ceiling. All solutions can be ideally combined with one another, creating individual zones for interior spaces. A tranquil and serene setting, both visually and acoustically. ARCHITECTS desktop offers a number of options to easily and flexibly place panels on tables, sideboards, chests, and cabinets/cupboards. Unpretentious bases in specially selected anodized aluminum colors can be ideally combined with the textile-covered ARCHITECTS panels to form a perfect unit with an airy and debonair confidence. Likewise, the magnetic base solutions (magnetbase) offer unity and perfection and provide the basic requirements for setting up panels on metallic sideboards and tabletops. All desktop solutions are highly adaptable and offer well-defined aesthetics thanks to the ability to freely position panels. 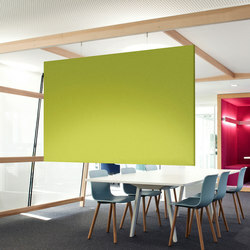 ARCHITECTS air stands for panels that can be used with the cable suspension system. 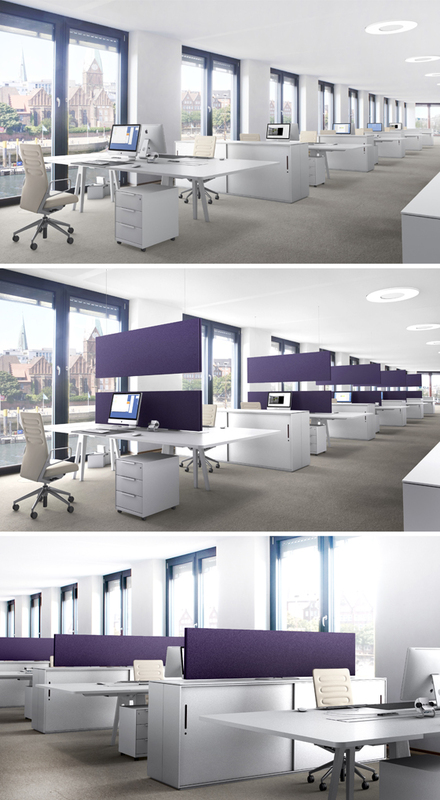 It is extremely easy to suspend panels horizontally or vertically from the ceiling. air standard offers the traditional solution using screws and anchors to suspend the panels. In addition, panels can be installed from metallic ceilings without any additional tools using magnet systems (air magnet). Or two or more panels can be connected (air link) to suspend one panel from another. With ARCHITECTS air solutions, there are many options to flexibly design interior spaces from above and they can be ideally combined with any system we offer. ARCHITECTS ground level offers a range of solutions for setting up panels on floor surfaces. 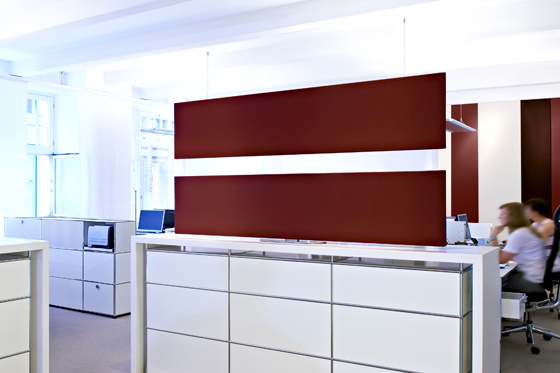 The Privat Wall and Little Privat Wall partitioning systems are based on the concept of an unadorned base that can readily accommodate the panel. The fact that the panel can be positioned horizontally or vertically is the special feature. 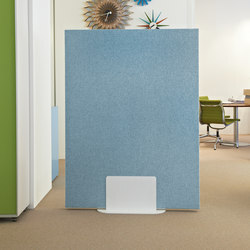 As a result, the Private Wall system offers two heights and widths in one product. A spectacular world of colors that ideally acts in concert with the overtly straightforward product style. The 107 colors of the Divina, Divina Melange, and Divina MD fabrics by Kvadrat in the current collection confidently join forces, creating a harmonic piece. The unique collection of fabrics forms the basis of acousticpearls' matchless ability to design a wide variety of applications. At acousticpearls, our approach to designing interior spaces is holistic, and we develop sustainable products that offer more than just durability. They incorporate environmentally-friendly means to connect materials and high-quality components that are free of harmful emissions, which are decisive criteria when creating a healthy indoor environment. ARCHITECTS fulfills the LEED standards for sustainable design in architecture, having been awarded the GREENGUARD seal of approval and certified in the highest rating category by GREENGUARD, an accredited international institute for green building.